Now I get the whole logic behind the “don’t drink and drive” motto, and I’m with them on that one all the way. Sheesh – I’m so worried about my reflexes I’m scared to drive home when I’ve had rum pudding for dessert at a restaurant. But as a parent of a teenager who is learning to drive, I’m beginning to wonder about this requirement that I can’t drink and ride. It’s a common joke in our house that when our teen asks for a some driving time behind the wheel that the response is, “No, sorry, can’t take you right now. I need a glass of wine first.” And, no, I don’t really do it, but I can’t imagine how much nicer it would be for me – and her – if I could just relax a bit more. It’s just so hard to relax when every other moment I see an impending crash in all its gory detail. 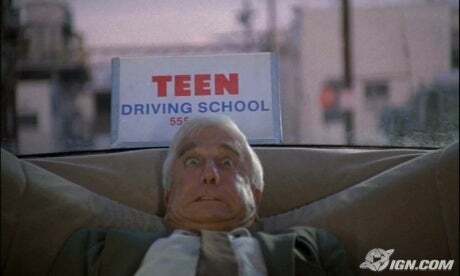 Instead I look a lot actor Leslie Nielsen (pictured above in the movie Student Driver). About now is when both my daughter and I wish that I had a sedative – or maybe half of our local pharmacy’s supply of something to calm me down. She’s a pretty good driver, so I’m thinking it’s my imagination that’s the problem. She backs a little over the curb at the local elementary school, and I’m picturing the principal’s office window being taken out as the car surges backwards. I see cute little student drawings flying off the office walls and the poor janitor running for his life. I see rabbits peeking out of their hiding places in the nearby bushes and residents nearby running with their video cameras to post the carnage on Youtube. Now I’m an author, so I’d be happy with my fifteen minutes of fame. I just don’t want it to come in a real-life comedy video posted by some other guy who gets 4 million hits overnight. I haven’t resorted to drinking yet. But I’m thinking that maybe next time I’ll try going blindfolded. Wonder if that will help at all.